This book, you guys, THIS BOOK!!! OMG! 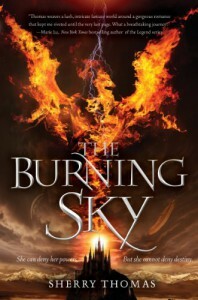 I already knew that Debby and Kelly loved this book, but still, I cannot believe how much I loved The Burning Sky!! I don't even know where to begin! I read this over the space of 6 days and was excited EVERY TIME to get back to it! Know that it's not the book that made me take forever to read it, I've been SO BUSY lately that I hardly had time to breathe, let alone read. But let's get back to the part where I was EXCITED about this book! I've missed that feeling! I have read a couple of less than stellar books lately and it just felt so good to submerge myself in an amazing world again! I totally adore both Iolanthe and Titus! They are both so incredibly strong and smart and charming and JUST LET ME HUG YOU OK?? I was rooting for them, even when Titus breaks Iolanthe's trust! They both want to do the right thing and OMG, I just, I cannot even be coherent about this! 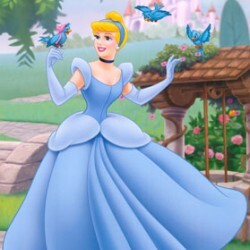 Iolanthe is awesome and powerful and brave and just generally my kind of girl! And TITUS! Did I ever tell you guys how much I love princes? Cause I do! And Titus is the right kind of prince, all swoonworthy and noble! He's created his whole life and the way he appears to the world around this task he's been given and I cannot help but admire his dedication. AND YOU GUYS, THE ROMANCE!!! *SWOON* I wanted to shake them and just #@%& KISS ALREADY! These two definitely brought tears to my eyes and it was glorious! I loved that the romance wasn't the most important plot point, but it is there and it adds to the story and it made my heart happy! I so love a good fantasy and Sherry Thomas really brought it with this debut novel! And there was so much for me to love! Two amazing main characters, solid worldbuilding, a romance that brought tears to my eyes and MAGIC! Be still my heart! And now the wait for the sequel will surely kill me... If you haven't picked it up already, WHAT ARE YOU WAITING FOR? GO READ IT! !